Wohow! 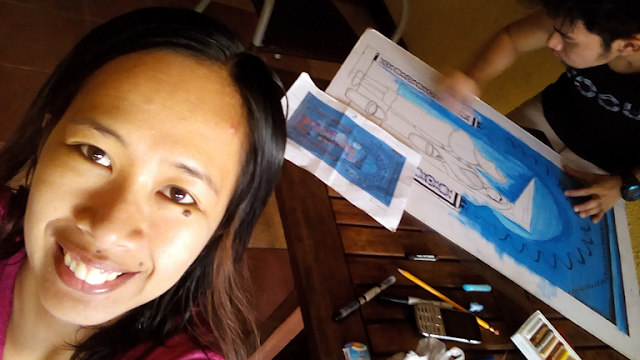 It took us a few days to conceptualize of what will be our creative entry for Dohop’s Win A Trip To Morocco that I blogged before for a week now. We brainstormed how we are going to have a creative picture and selfie at the same time. 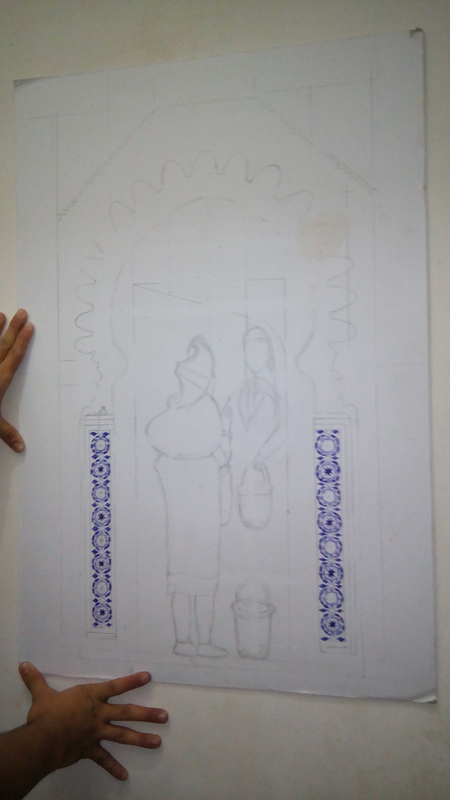 We arrived into the conclusion of painting a symbol of Morocco’s architecture using pastel in an illustration board as a background of the photo. He said it will take him 5 - 6 hours or so to finish. We chose the province of Chefchaouen which is known for the blue - colored architecture from its buildings to blue - rinsed houses. While unfortunately I have no talent to help him for the drawing part, the best thing I can do myself is to curate the basic guide and list of tourist spots in Morocco. To tell you the truth, Morocco is a country that I have so little knowledge. I am aware of its existence but it’s never included in my bucket list because of distance and even by chance I do not read much about it online. Actually if not for Dohop contest, I would not know that we Filipinos have no visa there for a stay not more than 60 days. 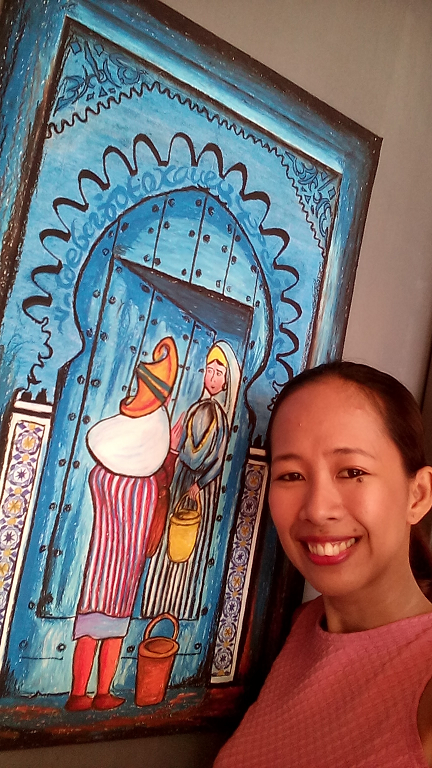 I even contacted the Embassy of Honorary Consulate of Morocco via Facebook here in the city of Manila to ask about what are the infrastructures, places and other things that represent Morocco in my own country where I can take a picture or draw inspiration but sadly there’s not much except from one and only known Moroccan restaurant named Kasbah in Taguig I found online. I don’t see very obvious social ties nor lots of Moroccans that frequent in the Philippines so I am not surprised. On my way to Kuala Lumpur from Phnom Penh last month, I met this Moroccan lady who is currently doing a two-month solo backpacking around SE Asia. We shared the same Air Asia plane , told me about the beautiful things to see in Morocco though I was not able to relate very much as again I barely know this place. Now at least I can manage to appreciate what she told me after doing a significant research about places to visit in Morocco, a Muslim country located in North Africa. It is also dubbed as the gateway to Europe because of the geographical nearness of France, Italy and Portugal. I also learned that Spain is even just an hour ferry ride from Morocco. Fez, Casablanca, Marrakesh and Rabat which is Morocco’s capital, these are the cities I always read online from travelers who have been here citing this Arab land is an exotic place for one of the best adventures in a lifetime. History says the majority of early settlers in Morocco are the Berbers but they don’t want to be called that way, please refer them as Imagzhifen, the locals of this country. Should the universe conspires, here are my top ten list of itinerary to Morocco. There are two main food that represents Morocco in the cuisine world – tagine or tajine and the couscous. Tagine or tajine - Anything can be turned to this dish - vegetables, lamb, chicken, fish including fruits usually dried, olives and preserved lemon. These are cooked over hot coals inside a conical clay pot that allows the steam to rise and condense, while slow cooking the food inside. In this country they either eat lamb or beef so it is a nice Actually there are a lot of Moroccan food I want to taste like the pastille, grilled fresh sardines and desserts. It is rude to say no once a Moroccan local offers you a tea, bear that in mind. The one usually served for a stranger who just arrived is the Maghrebi mint tea made with Chinese green tea, fresh mint leaves and sugar. Actually as I grow older each day, I am slowly finding my way to replace my obsession from coffee to organic teas which are known for antioxidant properties so this is a good news to be in a place where the people is aligned to some of my health ideals. Hammam is a room where one can bath on a steam using lava clay masks and black olive soaps for deep cleansing and exfoliation. There are public places where you can bring your own stuff and share this with the locals or if you are hygiene – conscious, find a hotel and riad that has this. In terms of beautification and wellness, I don’t think any girl will say ‘No’ to this. A Riad is a traditional house in Morocco that embodies the culture and heritage of this country. I was browsing through the photos online of these, I was completely stunned at how these look like. Usually a riad has a fountain with interior courtyard. A souk is where the ordinary Moroccans buy their stuff. From varying narrations of shopping in a souk, one should be extra careful while in the middle of haggling conversations or in a deep confrontation of a local offering you to buy something out of your budget or you don’t need at all. Still visiting a souk is a worthy thing to do in Morocco because here you will find the best craft in this side of the word. A medina is the old historic part of town usually walled and divided into Quartiers. Inside a Quartier there is a mosque, Hammam, public bread oven, water fountain and madrasa. The first time I encountered the words “Sahara desert”, is from Guiness world of record book back in high school, this is the world’s largest desert that stretches in ten countries including Morocco in Merzouga. It is also found in Chad, Algeria, Libya, Mali, Niger, Mauritania, Tunisia and Sudan. I want to see real and gigantic sand dunes while camping and trekking in this desert. Hollywood movies such as Troy, Babel, Gladiator, Time Bandits and Game of Thrones Fans were all shot here. I have not seen any of these films actually but the fact that Kasbah Ait Ben Haddou is chosen as the destination for these action slash adventure movies then this place is breathtaking. The Atlas Studios in Ourzazate is the world’s biggest film studio in the desert. I believe until now the set used to film Games of Thrones is still preserved to attract more people to see it. A Kasbah can also be called as a medina or an Islamic city but usually it connotes a house that bears the image of Morocco. It has high walls often without windows built on hilltops or near the entrance of harbors. I want to see kasbahs that are already centuries old or more. I’d like to spend a breakfast, lunch or dinner with a Moroccan family. The most authentic food is not served by the well accomplished chefs in five star hotels, it is actually in the simplest homes of the locals. I also learned that they also eat with their own hands. I also love doing the same. The only difference is that instead of rice in their tables they have a lot of bread. The huge chunks of these breads are also used to scoop too. Of course I will never ever forget to drop by to Chefchaouen. 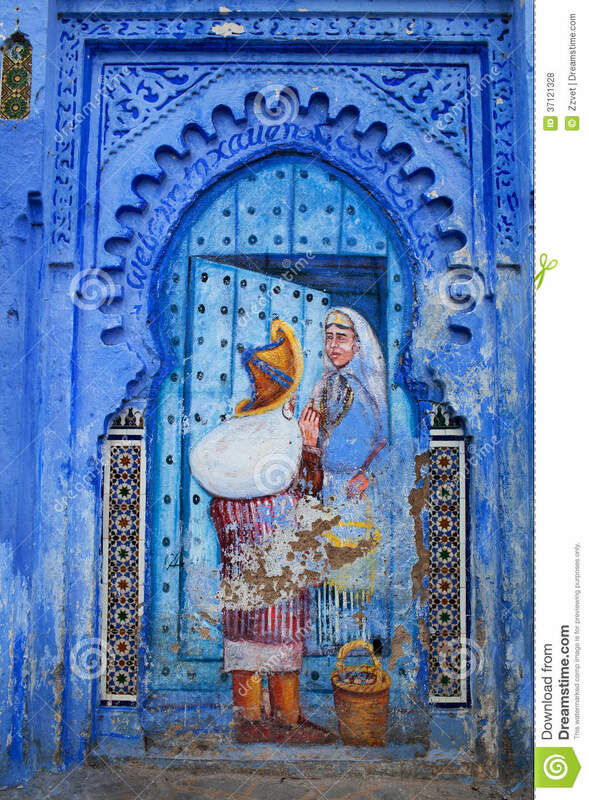 I want to know whyMoroccans like color blue – the houses, walls and even boats. The architecture and art found in the walls of riads are strikingly amazing. I’d like to get a Henna tattoo also. I look forward walking down the streets smelling the thousands of spices coming from the kitchen of Moroccan wives preparing meals for their loved ones. I want to smoke Shisha, I have done this here in Manila when I joined a food review of a Persian restauran before. I want to get lost and try my haggling skills in the souks for some items I can bring home. I want to have a gorgeous selfie in the Roman ruins of Volubilis too. I hope, wish and pray to represent Dohop at the 2015 World Travel Award for the category "World's Leading Flight Comparison Website" in Morocco. 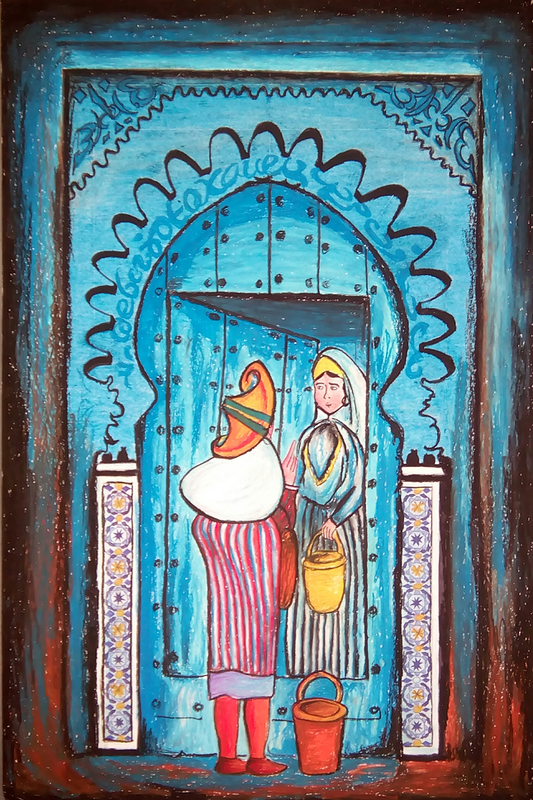 Note: This pastel painting was inspired by the Fresco painting wall at Uta El-Hammam square in Chefchaouen, Morocco, North Africa published by Dreamstime. Image source here.